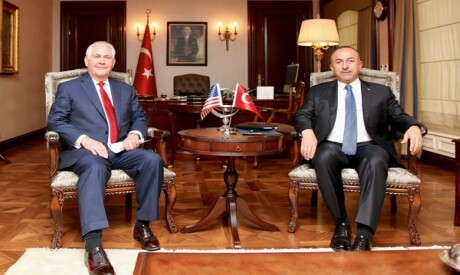 Tillerson walked out of Turkey’s capital with a promise from Erdoğan to normalise relations and to set up working groups to help deal with the two countries’ differences. Turkish officialdom and media, which had embarked on an “increasingly strident and often bellicose campaign against the U.S. for most of the past year” were a little confused about what to do next, Abdel-Meguid said. “In the aftermath of that visit, the very media organs that, for a year, snapped and growled at the very mention of the word Washington have been put to the difficult task of coming up with face-saving formulas for the diplomatic defeat,” he said. Regularly broadcasted “opinion polls” highlighting the Turkish people’s rejection of the U.S. “anti-Turkish” policy were forgotten. Opposition forces did not miss the opportunity to express their views on this humiliating development, Abdel-Meguid said, citing satirical quips on social media about how the mighty Erdoğan, in pseudo-Ottoman warrior garb, was forced into retreat. The military campaign in Syria’s Afrin is also still far away from success. “Contrary to Turkish propaganda, Turkish forces on the ground in Afrin are encountering stiff resistance, which is prolonging an operation that had been billed as a blitz campaign that would achieve immediate victory,” he said. Turkish forces are at risk of becoming inextricably bogged down in the face of fierce resistance from Kurds who are seeking to protect their families and homes, observers suggested.